A Roman Catholic religious order called the Carmelites was founded on Mount Carmel or Har HaKarmel in Palestine in the 12th Century. It was founded by a man named Berthold, either a pilgrim or a crusader, who died some time after 1185. The order was based at a site that it claimed had been the location of Elijah's cave, some 520 meters above sea level at the northwestern end and the highest point of the coastal mountain range in what today is northern Israel. According to mainstream Jewish, Christian and Islamic thought, and as described in the Books of Kings, Elijah had challenged 450 prophets of Baal to see whose deity could light a sacrifice on fire and therefore was truly in control of the Kingdom of Israel. To further increase the challenge while showing off, Elijah first poured water over his sacrifice to fully saturate the entire altar. 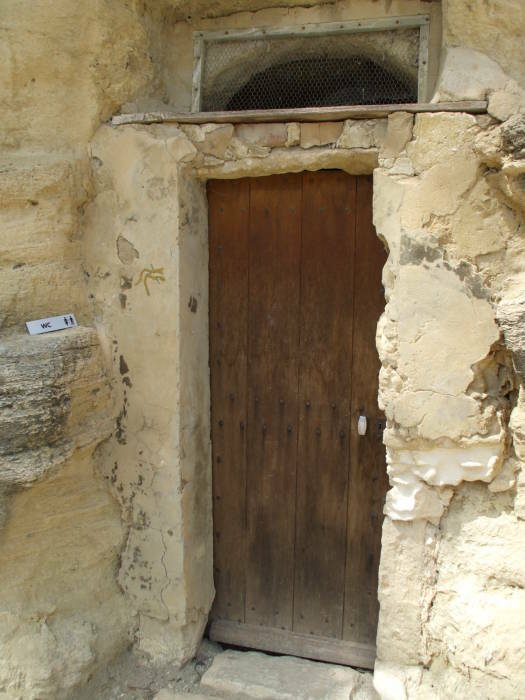 The Carmelite tradition is that a community of Jewish hermits had lived here from the time of Elijah in the mid 800s BC. The Carmelite order grew into one of the major Roman Catholic worldwide religious orders, although its home monastery was not nearly as successful as the overall movement. The monastery changed hands frequently during the Crusades, frequently being a mosque and known as El-Maharrakah or The Place of Burning. Napoleon converted it into a hospital in 1799, and then the Pasha of Damascus destroyed it in 1821. 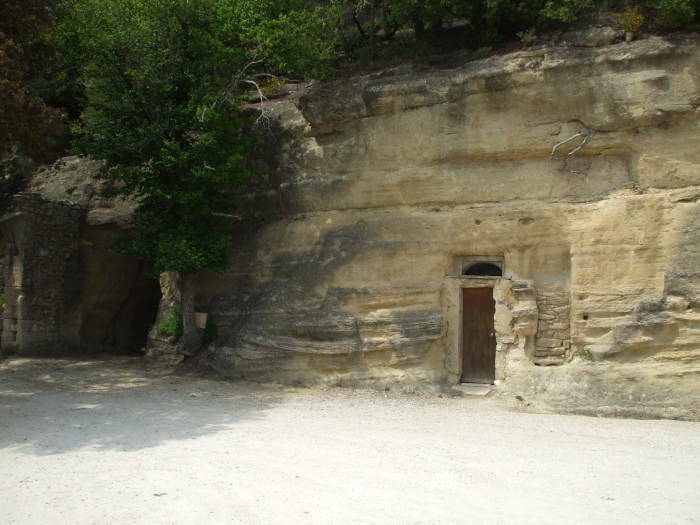 A new monastery was later built, directly over a nearby cave. A group of monks from Mount Carmel came to southern France soon after the monastery's founding, probably to get away from the Crusades. 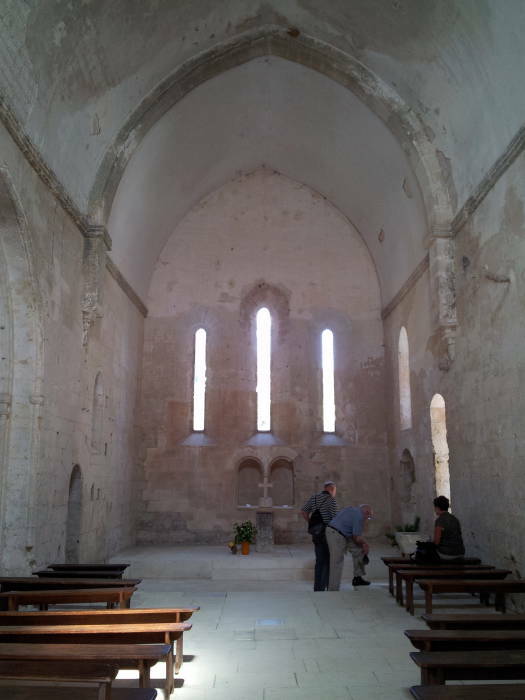 They first stopped to establish a small monastic community at Aygalades near Marseille. Then they moved inland, over the Luberon mountain ridge in Provence. Near the bottom of the north slope of that mountain ridge, just eight kilometers from the old Roman road joining Cavaillon to Apt (closely followed by today's D 900 highway), they established a new community. They initially lived in caves near a spring before building their Abbey of Saint Hilaire. 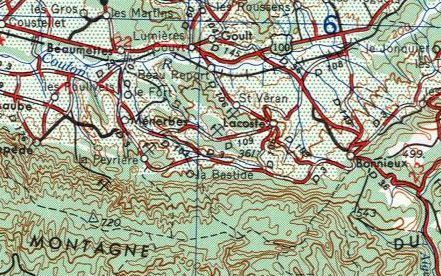 The abbey is between Ménerbes and Lacoste, off the D 109 road, located near the "D" marking the D 109 road in this map. Louis IX of France, King of France from 1226 until his death in 1270, went on two crusades: the Seventh Crusade in 1248 and the Eighth Crusade in 1270. In the first of those, he captured the port of Damietta in June 1249 and then marched through the Nile Delta toward Cairo. Crusader-era armies could not move quickly through swampy river deltas, that march took quite a while. By April 1250 they were out of the delta and into the Battle of Fariskur, where Louis lost his army and was personally captured by the Egyptian Mamluk army. He was ransomed for 400,000 livres tournois (about a third of the annual revenue of France) plus that city of Damietta. Louis then spent four years in the Crusader kingdoms of Acre, Caesarea and Jaffa, assisting in the rebuilding of Crusader defenses and conducting diplomacy with the Islamic powers in Syria and Egypt. The French garrison in the region was later used as a justification for the French Mandate in the partitioning of the Ottoman Empire after World War I.
Louis had visited Mount Carmel, and on his way back to France in 1254, he stopped at the Abbey of Saint Hilaire. That would have been right around the time they were dedicating their newly built abbey complex. That year is carved on an exterior wall of the church, seen here, in the inner cloister. Louis was later canonized, hence Saint Louis and all the other places named after him. 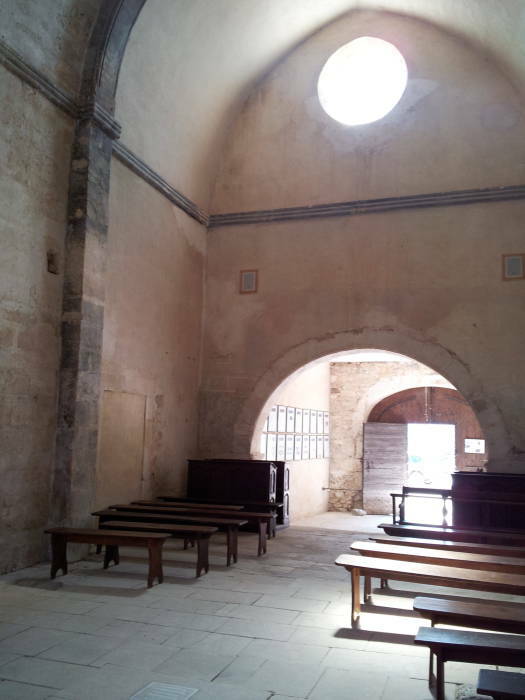 The main church has a simple Cistercian plan: a rectangular nave and three Gothic windows at the chevet end. The roof is a slightly pointed arch. A small adjoining Romanesque chapel is the oldest known structure in the abbey. The nave could hold about a hundred people. A side door opens onto a small cloister, with the chapter house, kitchen and dining hall forming its other three sides. The abbey buildings are on a terrace built against a steep hillside. Your approach from today's road brings you to the main entrance to the church. Immediately beyond the structures is an open garden area up on that stone walled terrace. Down off that terrace and along the hillside are the orchards and other agricultural plots of the abbey. 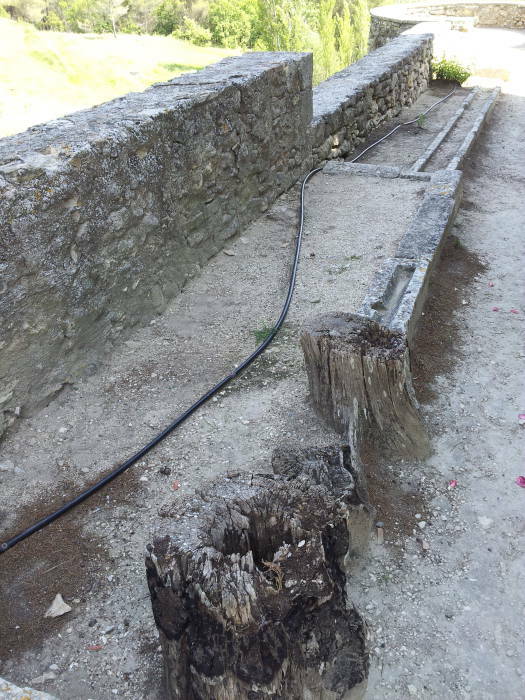 It's up on that terrace at its far corner that we find the remnants of the medieval plumbing! This stone water tank is against the far wall of the terrace, about half-way along that wall to the extreme far corner. 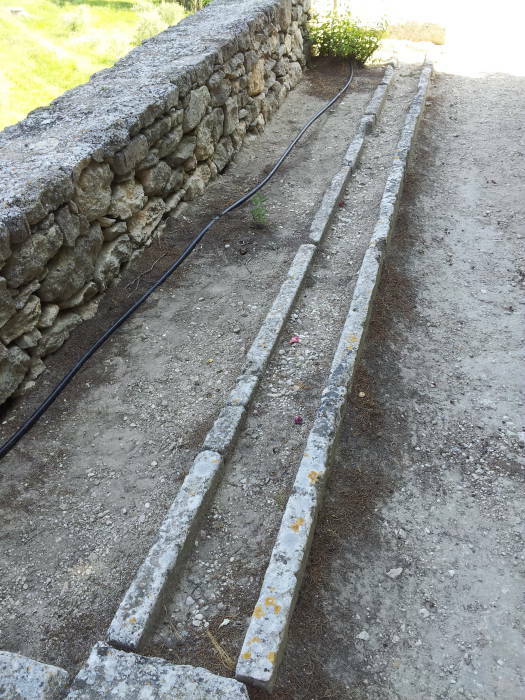 A series of narrow stone channels runs down from that tank parallel to the rear wall. Below is where things get really interesting. In the final four to five meters that water trough is nearly level, slightly wider, and about the width of a large bench from the wall. 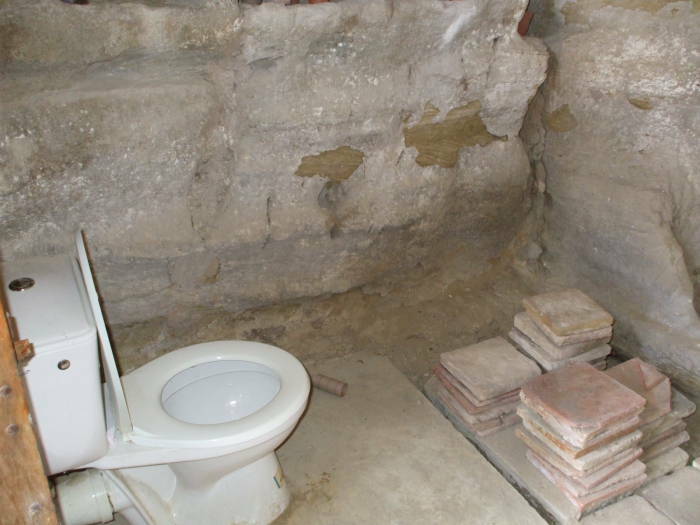 This is a necessarium, that being the term for a communal toilet facility commonly found in a monastery. In the 19th century the term reredorter was coined, from the Middle English prefix rere- (from Anglo-French) meaning "behind" and the medieval term dorter for the monastic dormitory. The monastic dormitory was typically built on the east side of the main cloister, and its necessarium was usually attached to its south or east side, putting it along the dormitory walls furthest from the church. Compare this design to the communal toilets in Ephesus, where you see a very similar water trough running along a row of toilets. 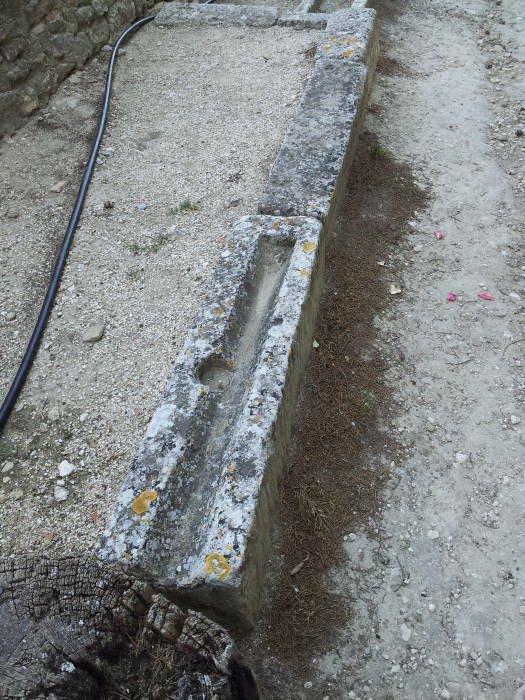 The toilet bench survives at Ephesus, as it was made from marble. Here, the toilet itself would have been made from wood. Also, it would have been enclosed in a wooden structure. 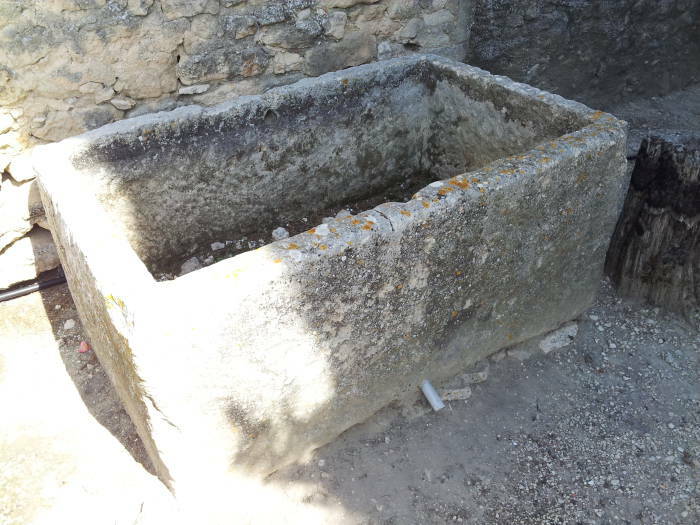 The design and function of this necessarium are easier to discern than those of the signposted latrine blocks at the Saint Andrew Cathedral Priory in Scotland and the Glastonbury Abbey in England. At the far end, a drain leads straight down. It is now largely blocked by this pillow-shaped stone. 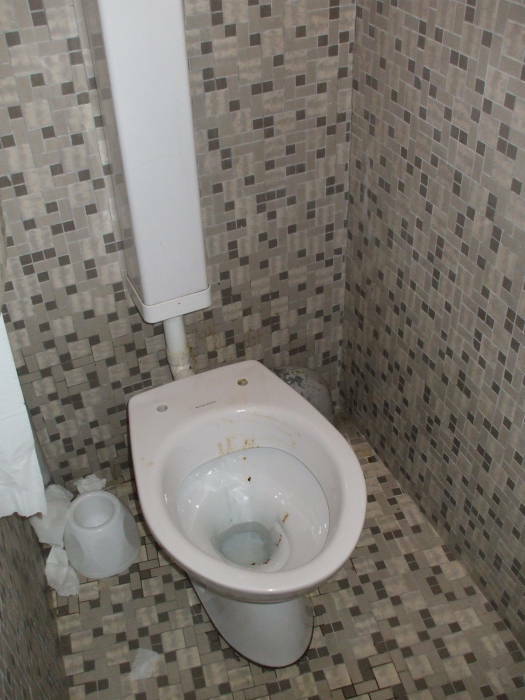 Notice that the drain is against the wall, where it would have best served to drain the waste from the row of toilets. Water from the hand washing trough would have helped to flush the waste down that drain. The blocked drain is in the foreground in the first picture above. The human waste would have helped to fertilize the agricultural plots of the abbey. 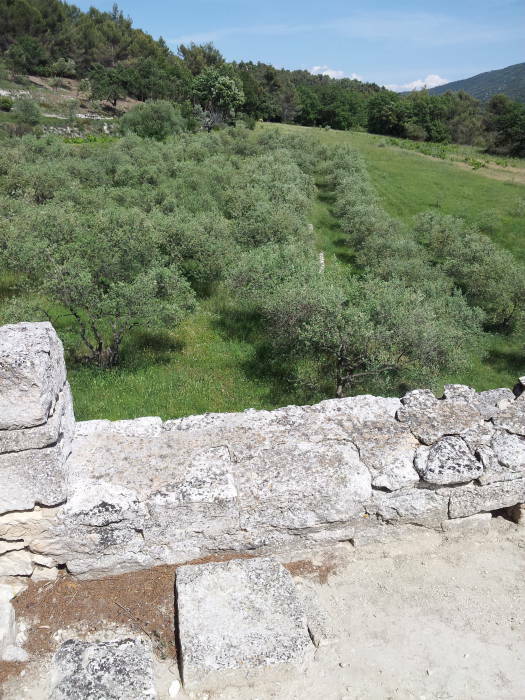 Today there is an olive orchard immediately beyond the terrace. Who knows, it might have been an olive orchard back in the early days of the abbey. 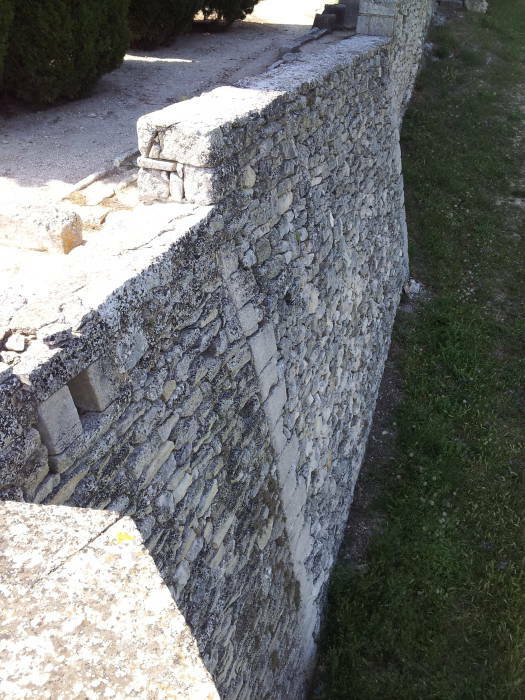 The second picture above shows the exterior of the terrace wall, as seen from a small polygonal structure at the terrace corner. It looks as though that drain runs nearly horizontal about a meter and a half further toward the terrace corner, and then opens near the top of the wall. That would have been a smelly mess back then. 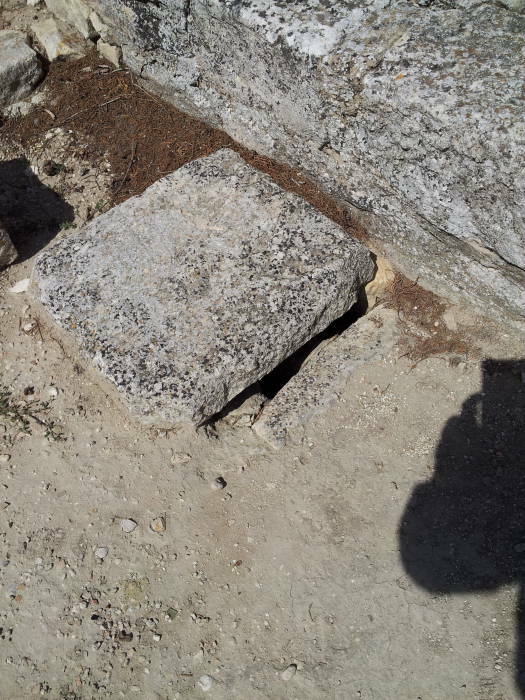 Back in the parking area, today's visitor can use this toilet facility carved into the soft stone of the hillside. On the topic of the church in France in the Middle Ages, this is Chartres Cathedral. It was built just before the abbey seen above, between 1194 and 1250. 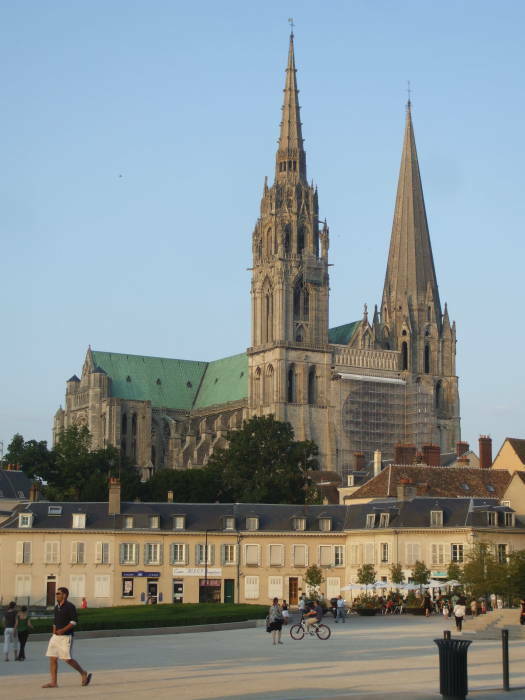 This is just the current church, at least the fifth since the town of Chartres was made the seat of a bishop in the 4th century. It's enormous: 130 meters long, 46 meters wide, with the nave 37 meters high and the two towers 105 and 113 meters tall. Chartres was a pilgrimage destination long before the Gothic cathedral was built in the early 13th Century. During the Merovingian and early Carolingian dynasties, from the mid to late 400s until soon after 800, pilgrims came to see the Puits des Saints-Forts, the Well of the Strong Saints, a well that various local early martyrs had been thrown down. These included Piat, Cheron, Modesta and Potentianus. Then, in 876, the cathedral acquired its big drawing card, the Sancta Camisa or the Holy Nightgown, supposedly the tunic worn by Mary during Jesus' birth. That's it in the case below. The legend was that Charlesmagne gave the tunic to the church, having received it as a gift from the Byzantine Emperor Constantine VI when Charlesmagne was passing through Constantinople on his way home from a crusade to Jerusalem. The problem with this story is that Charlesmagne never went to the Holy Land. The reality is that it was a gift from Charles the Bald, who ruled as King of the Franks and Holy Roman Emperor about 60 years after Charlesmagne. 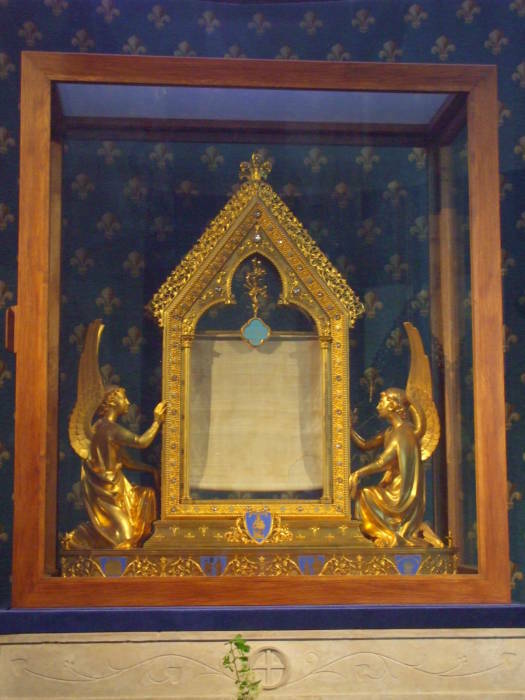 That would have been the mid to late 800s, and there is evidence that this relic was an important object of pilgrimage until the 12th Century. Meanwhile, there was still that well for people to come and see. In late medieval times, a story was invented that the cathedral had been built on the site of a pre-Christian sect of druids who worshiped "a virgin who will give birth." The cathedral was to be destroyed during the French Revolution, as part of the general attack on organized religion. The Revolutionary Committee decided that it should be destroyed by explosives, and asked a local architect to organize the project. He saved the cathedral by explaining if they did that, the resulting rubble pile would block the streets and take years to haul away. They did remove the lead roofing, however, to make bullets. Here we see the rather dingy toilet in the nearby underground parking facility. Really it's un établissement public de stationnement, but the creeping English invasion of terminology has recently led to the increased use of the term «le parking». At least the term «le skid-mark» has not yet elbowed its way into French. Or see the complete menu below! A Sani-Flush blue border indicates a toilet, sink, shower, or other plumbing that I've used. Did Thomas Crapper Invent the Flush Toilet? So Who Did Invent the Flush Toilet? Bowl or Bin? Where do I put used toilet paper? What is a Chamber Pot? How Can I Install My Own Squat Toilet? What is a Toilet Snorkel? Can You Clean a Toilet With Fire? Should I Incinerate my Sewage in the Basement? Who is the Toilet Guru? When Did Gender Separation of Public Toilets Begin? 28 BC – 300s AD Roman (Gaul) NEW! 1907 Barbary Coast Saloons NEW! Peeing Figures in Art Updated! Buddhist Toilets & Etiquette Updated! Japanese Toilet Gods & Demons Updated! Home Health Care Toilets NEW! How long have my Toilets of the World pages been around? They started in the mid 1990s as a single page on a Purdue University server. The Internet Archive Wayback Machine lets you see what that looked like as far back as January 17, 1999. My cromwell-intl.com domain appeared in September, 2001, although the Wayback Machine didn't notice its one enormous Toilets of the World page until January 17, 2002. Some time soon after that I split it into categories, and the collection has grown ever since. In December, 2010 I registered the toilet-guru.com domain and moved the pages to a dedicated server.